Make My Holiday- Artists Announced! Wow! 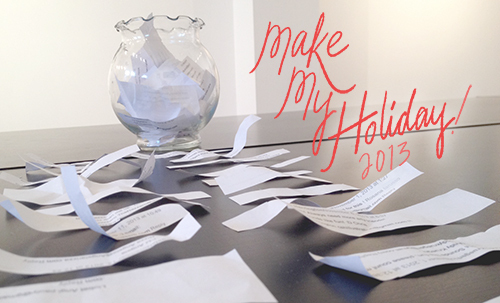 Thanks to everyone who applied for this year's Make My Holiday! It was a fantastic turn out and we are excited to see what you make for one another! This is such a great time of year for giving and making a new art friend! Good luck and have fun everyone! We just finished selecting partners- all of the artists pairings were made by the luck of the draw! So take a look at the instructions below and look for your partner in the listing. 1. Say hello to your new art friend! - send a quick hello email and introduce yourself! 2. Request your new friend's postal address! Remember that this is a postal swap, so be prepared to ask for all the details! 4. Send it on over by DECEMBER 9th so they receive it in time for the holidays! 5. Once you receive it, send us a photo of you and the gift you received! You can send it to hello@lightgreyartlab.com! I'd love to post the great things that everyone gets on the blog!